The NBA announced on Wednesday that Charlotte will host the 2019 All-Star Game, fulfilling the league’s initial plan to return the event should North Carolina modify or repeal House Bill 2. Charlotte was initially slated to host this year’s All-Star event, but the NBA pulled the high-profile exhibition last July in response to the discriminatory legislation, which was passed in March 2016. The game was held instead in New Orleans. The league joins the NCAA and ACC in returning its lucrative neutral location events to the state that was, until it passed its recent half-assed repeal in late March, being boycotted by the sports leagues for HB2. The bill, which gained notoriety for being an anti-trans bathroom bill, also prevented cities from passing their own anti-discrimination ordinances. That measure will remain in place until December 2020 as a stipulation included in HB 142, North Carolina’s last-ditch attempt to repeal HB2. The three-year moratorium was initially a six-month measure in a proposed repeal that was rejected this past December; when the NCAA’s deadline for postseason event scheduling came, North Carolina lawmakers on both sides of the aisle quickly cobbled together HB 142, theatrically hemming and hawing over its shortcomings—Republicans positing that repealing HB2 at all was weak and immoral; Democrats dragging their feet over the extended moratorium—but ultimately passing it. The bill fulfilled its true purpose, leaving trans citizens with little hope for future protections while offering sports leagues just enough wiggle room to flock back to the state. 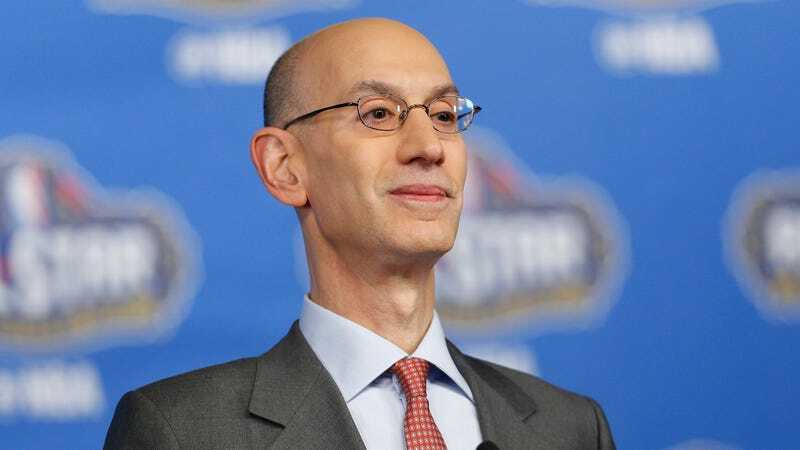 Like NCAA president Mark Emmert, NBA commissioner Adam Silver addressed the concerns that have been voiced over HB 142 in his official statement. And like Emmert, Silver’s words amounted to little more than a statement of acknowledgement that North Carolina’s LGBT citizens are less protected today than they were prior to HB2. The NBA’s decision to accept HB 142 as any sort of reasonable response by the GOP-driven North Carolina legislature has been addressed by both Equality NC and the Human Rights Campaign. The leadership from both organizations sent an email this afternoon to issue a reminder that while Silver wrote of the league requiring “all venues, hotels and businesses” to adhere to “a set of equality principles” and “anti-discrimination policies,” such measures are currently impossible to pass at a state level because of the Republican-dominated House and Senate. Thanks to HB 142, North Carolina’s progressive hubs will be incapable of addressing matters of discrimination on their own for another three years. “While we understand the concerns of those who say the repeal of HB2 did not go far enough, we believe the recent legislation eliminates the most egregious aspects of the prior law. Additionally, it allows us to work with the leadership of the Hornets organization to apply a set of equality principles to ensure that every All-Star event will proceed with open access and anti-discrimination policies. All venues, hotels and businesses we work with during All-Star will adhere to these policies as well.